Are you always losing things, maybe mislaying your keys at home, or leaving your phone in the restroom at work? Wouldn’t you love to have a device that could easily help you find your things again? These colorful little Chipolo tracker tags can do exactly that. With the help of Bluetooth 4.0 technology, a useful smart phone app, and even community support, you’ll always be able to locate any of your tagged items in a snap. Made of sturdy plastic, and only the size of a coin, it’s so lightweight and unobtrusive that you’ll forget it’s there until you need it. And, since the device is so easy to use, even your kids can keep track of their stuff, like backpacks or favorite toys. 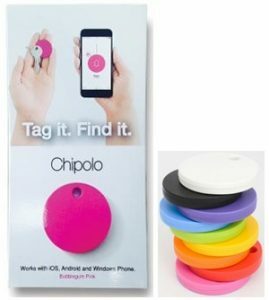 The Chipolo (Retail $29.99) comes in 9 fun colors, which is handy, since you can connect up to 9 Chipolo trackers to a single app. You can also link the same Chipolo to as many as 4 different phones, so every member of your family can find a shared item. It come with a key ring connection as well as an optional adhesive circle, allowing you to attach it to almost anything, like keys, laptops, tablets, backpacks, and so much more. Once you assign a Chipolo to one of your easily lost items, just register it inside the app, and you’re all set. The app allows you to keep track of your item several ways. If you’re within the 200 foot Bluetooth range of your Chipolo, you can ask the app to ring it, and the tracker will produce a loud sound for you to follow. You can also set it to notify you if your phone goes out of that range, so you can turn back and grab your item if you need it. Or, since the app will record the last location of the Chipolo when it left the connection range, you can find it on the in-app map and retrieve it at a more convenient time. While you’re looking at the map with your Chipolo location marked, the app will track your progress towards it, and even begin to count down your proximity once you move within the 200 foot Bluetooth range. 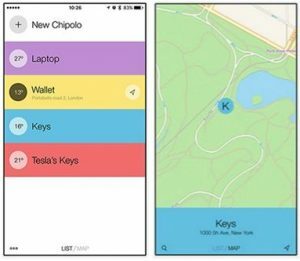 If, for some reason, you just can’t manage to find your Chipolo tagged item, you can reach out to the wider Chipolo community, and someone else’s app will detect it if they move within range of your device. If you have more then one Chipolo registered to your app, you can see where all of them are located at once in the map function. What if you lose your phone instead of your Chipolo? No problem! You can shake your Chipolo tracker and it will make your phone ring, even if it’s set to silent mode. And, once you’ve been reunited with your phone, you can even use the Chipolo to take a selfie and mark the achievement. Just set your phone down in a good selfie position, strike a pose, and shake the Chipolo to start the shutter timer countdown. But, what if you’re having a super unlucky day, and you’ve lost BOTH your Chipolo and your phone? Maybe you’ve left them in your purse at a restaurant, or maybe you’re just having one of those kinds of days. There’s a solution for that as well. 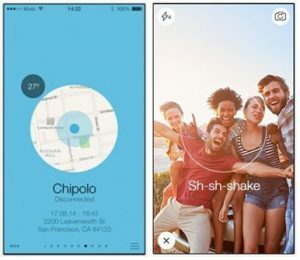 Just get on the Chipolo web app from your computer, where you can find them both by either making them ring or seeing a map of their last location. You can even use this web site to send a lock-screen message that will appear on your phone for anyone who might find it. The Chipolo is very useful for such a small device, and has a very long life. The easy to replace battery lasts for 6 months, and every Chipolo comes packaged with a 2nd battery, to set you up for a full year right out of the box. The device will notify you when the battery is low, so you don’t even need to keep track of the time. The app is available for iOS, Android, and Windows smart devices, and can be downloaded either from those respective marketplaces or directly from the Chipolo web site. I know that I have spent more time than I care to admit, walking aimlessly around the house, looking for my keys, phone, wallet, etc. If you’ve ever done this too, a Chipolo will be money well spent. Go to the Chipolo web site, choose your favorite color, and bring one home with you today. Can’t choose a color? Buy 2, or 3…or 9, and never misplace anything ever again!